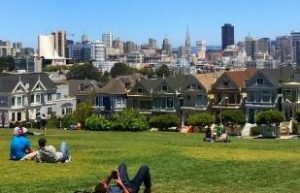 Alamo Square is a residential neighborhood and a beautiful park located in the Western Addition district of San Francisco. It is famous for ‘The Painted Ladies,’ or ‘Postcard Row,’ the beautiful Victorian Homes, which form a storybook row on the east side of the park, with the backdrop of the Financial District. Many visitors remember this location as the opening scene in the ‘Full House’ TV series. In addition to ‘The Painted Ladies,’ you will see many stunning and architecturally distinctive Victorian mansions in this neighborhood. Twin Peaks are two connected hills standing on the highest elevation of San Francisco (after Mount Davidson). 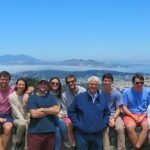 On clear days the drive to the top, and spectacular overlook offers 360° sweeping and beautiful views of San Francisco Bay Area and the Pacific Ocean. Sutro Tower, standing 297.8 m (977ft) atop Twin Peaks, was formerly used as a broadcast transmitter for radio and television stations, and is considered a landmark. Be sure to go there on its not foggy and avoid the rush hour. Built in the late 19th and early 20th century, Japanese immigrants began moving into the area following the 1906 Earthquake. By World War II, the neighborhood was one of the largest enclaves of Japanese people outside of Japan, as it took on an appearance similar to the Ginza district in Tokyo. After the Japanese attack on Pearl Harbor, residents were forced to move out as a result of internment. In 1957, San Francisco entered into a Sister City relationship with the city of Osaka and named the neighborhood Japantown, ‘Little Osaka.’Japantown offers an amazing number of traditional restaurants, sushi bars, and karaoke lounges. City Hall of San Francisco is the focal point of the Civic Center area. Its European baroque dome is the fifth largest in the world, and is actually 14 inches higher than the dome in Washington, D.C.! The rotunda is a spectacular space and a venue for special civic and public events. The office of the Mayor is on the second floor where bronze busts of former Mayor George Moscone and his successor Dianne Feinstein can be found, reminding us of the assassinations of Moscone and Harvey Milk in 1978. City Hall is featured in many famous movies including The Rock, Dirty Harry, and James Bond 007. Joe DiMaggio and Marilyn Monroe were married at City Hall on January 14, 1954. Also in the Civic Center area, you will see the Asian Art Museum, San Francisco Public Library, Davies Symphony Hall, the Opera House, the Veteran’s War Memorial Building (where the United Nations Peace Treaty was signed in 1945), and the California State Building. Each neighborhood of the city is unique and authentic, including the Castro District, which draws eclectic crowds from all over the world. Castro District is one of San Francisco’s most vibrant and culturally diverse communities, home to beautiful Victorian homes, popular bars, restaurants, and nightclubs. The Oscar-winning movie, Harvey Milk, starring Sean Penn, was filmed at the historic Castro Theatre, which is also known for its Wurlitzer pipe organ and sing-along movies. You will notice many rainbow flags reflecting the neighborhood’s support of LGBT rights. In the 1970s, the Castro was home to Harvey Milk, California’s first openly gay public official and one of the first in the USA. His steadfast efforts in the gay rights movement not only earned him the title the “Mayor of Castro Street,” but his political efforts helped put San Francisco at the forefront of the gay rights movement. Noe Valley neighborhood was named after José de Jesús Noé, the last Mexican alcalde (mayor) of Yerba Buena, the original name for San Francisco, who owned the area as part of his Rancho San Miguel. Noe Valley contains many examples of the classic Victorian and Edwardian residential architecture for which San Francisco is famous. Originally a working class district, it is now a more gentrified neighborhood, popular with young families who enjoy its coffee houses, bistros, home-decor boutiques, chic clothing shops and bookstores. Don’t miss St. Paul’s Catholic Church, the location for the movie Sister Act. Mission District: San Francisco’s Mission District is a funky neighborhood that has a cool vibe and is filled with interesting murals authentic, local Mexican ambiance. It’s famous for its diverse cultural background, outstanding murals, ethnic restaurants, underground creek, and historic Mission Dolores. The neighborhood maintains a precarious balance between its colorful Latino roots, gritty subculture, and growing population of technology professionals. ‘The Mission’ is warmer than all other neighborhoods thanks to its geographical location, which insulates it from the fog and wind from the west. It is a ‘city’ within the city, filled with surprises, art, history, landmarks, and terrific murals relating the history and subculture of this unique neighborhood. Among the local landmarks is the Mission Revival structure style of the Women’s Building considered a ‘masterpiece’ of mural art, but other hidden gems and alleys are filled with art and murals. Potrero Hill is a residential neighborhood known for its sunny weather, and incredible views of the San Francisco Bay and city skyline. Potrero Hill – and its nearby neighbor, Dogpatch – is now home to trendy restaurants, community gardens, craft breweries, wineries, and murals, including one of OJ Simpson who grew up in the neighborhood. Vermont Street in this neighborhood is often referred to as the true ‘crookedest street’ due to its steepness and sharp switchbacks (and was the location for car chase scenes in the movies ‘Magnum Force’ and ‘Bullitt’), but Lombard Street attracts more visitors due to its location and views. We will drive down both streets on your full-day tour. Anchor Steam Brewery, the oldest brewery in San Francisco, was relocated here in 1979. Built in 1892, the Ferry Building, with its 245 ft. tall clock tower, was the hub for all passenger and cargo ships coming into San Francisco. With the building of the Oakland Bay Bridge and Golden Gate Bridge, ferry transportation ended for a number of years. Converted into office space in the 1950’s, and severely damaged in the 1989 earthquake, it was extensively restored and renovated to its original beauty in 2002, and is now a destination for all food lovers, and famous for its Farmers’ Markets. The Ferry Building is also the embarkation point for the Golden Gate Ferries to Sausalito, Larkspur, Tiburon, and the East Bay. The Ferry Plaza Farmers Market is also a California certified farmers’ market operated by the nonprofit Center for Urban Education about Sustainable Agriculture (CUESA). The market is widely acclaimed for both the quality and diversity of its fresh farm products, and artisan and prepared foods. It is renowned throughout the country as one of the top farmers markets to visit. On any day, especially Saturdays, some of San Francisco’s best known chefs, and most famous farmers, can be seen at the market. The market provides a forum for people to learn about food and agriculture. Each week nearly 40,000 shoppers visit the farmers market. Originally named Pacific Bell Park, then SBC Park in 2003 after SBC Communications acquired Pacific Bell, the stadium was ultimately christened AT&T Park in 2006, following SBC’s buyout of AT&T. The park stands along the San Francisco Bay, a segment of which is named McCovey Cove in honor of former Giants player Willie McCovey. AT&T Park has also played host to both professional and collegiate American football games. The stadium was the home of the Foster Farms Bowl, an annual college postseason bowl game, from its inaugural playing in 2002 until 2013 and also served as the temporary home for the University of California’s football team in 2011. 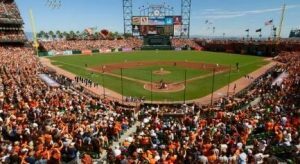 Professionally, AT&T Park was the home of the San Francisco Demons of the XFL and the California Redwoods of the United Football League. The Yard at Mission Rock has become one of the hottest spots for food, drink and to simply have fun. Located across McCovey Cove on 3rd and Terry A Francois Blvd, The Yard boasts a one-of-a-kind gathering spot close to AT&T Park. You can find an all-new mini soccer field at The Yard. Perfect for groups young and old to gather. Of course, you will find Anchor Brewing and Crêperie Saint-Germain sharing a 32-seat area to try out their craft beers or take in some the available culinary delights. MoMo’s is one of the hot spots to check out before, during and after Giants games at AT&T Park. Located directly across the street from the ballpark, the restaurant named after the owner’s grandmother attracts such a large crowd before and after games, scores of Giants fans are spilled out onto the sidewalk just trying to be close to the festivities. MoMo’s has an upscale food menu and impressive wine list, along with several draft and bottled beers, along with crafted cocktails. San Francisco’s Pete’s Tavern has a reputation of being the best sports bar in the city. Like MoMo’s, it’s across the street from AT&T Park and even though capacity is around 1,000, Pete’s has people lined up outside, waiting to get in. With a ton of space and 22 flat screen TVs, Pete’s lives up to its reputation as San Francisco’s best sports bar and a great spot to enjoy watching the game. Pete’s Tavern has a great food and drink menu, serving outstanding bar food along with beer, fine wines and specialty cocktails. With several TVs lining the walls, this neighborhood sports bar is a highly rated spot to grab a beer and some tasty pub grub. Home games aren’t likely to have a lull during the game but visitors can still play a game of pool, shoot darts or just hang out and talk about why the Giants can win back to back World Series championships. Located near the intersection of 7th and Harrison streets. Frequently mentioned among the best sports bars in San Francisco, Ted’s is known for great service and bar food. This very popular dive bar has several TVs to watch televised games from AT&T Park while enjoying a drink or more. The SS Jeremiah O’Brien is one of two remaining fully functional Liberty ships of the 2,710 built and launched during World War II. The O’Brien has the distinction of being the last unaltered Liberty ship and remains historically accurate. Moored at Pier 45, Fisherman’s Wharf, she is a premier San Francisco attraction. 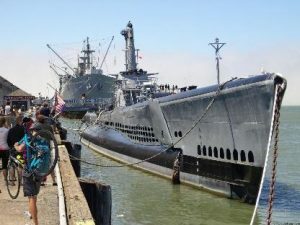 A living museum on the National Register of Historic Places and a National Historic Landmark, the O’Brien transports you back almost seven decades to when sailors braved the harshest of high seas and threat of enemy attack. San Francisco Ocean Beach is a beach on the west coast of San Francisco, California, United States, bordering the Pacific Ocean. It is adjacent to Golden Gate Park, the Richmond District, and the Sunset District. The Great Highway runs alongside the beach, and the Cliff House and the site of the former Sutro Baths sit at the northern end. The beach is a part of the Golden Gate National Recreation Area, which is administered by the National Park Service. 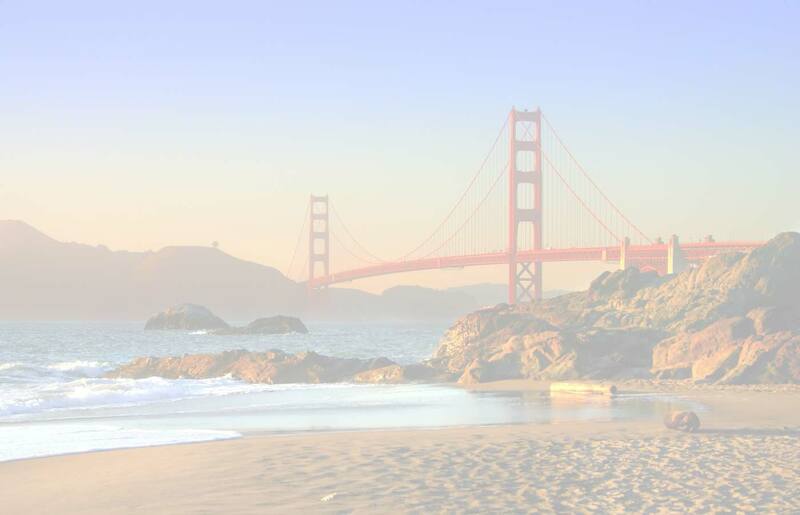 During the late spring and summer, San Francisco’s characteristic foggy weather frequently envelops the beach. The average temperature for the last 5 years has been 13.2 °C (55.8 °F) However, the beach is popular with surfers and participants in bonfire parties. 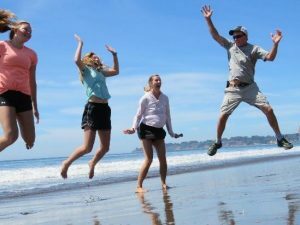 More beach-friendly weather occurs in late fall and early spring, when fog is less prevalent. The water at Ocean Beach is noteworthy for its strong currents and waves, which makes it popular among serious surfers. The water is cold, due in part to a process known as upwelling, in which frigid water from below the ocean surface rises to replace the surface water that moves away from the beach as a result of the Coriolis effect. The rapid rip currents and cold water make the ocean dangerous for casual swimmers and even those who simply want to set foot in it, and swimmers have been swept away and drowned. Nevertheless, the beach is one of the Bay Area’s top surfing spots. The southern portion of the beach by Sloat Boulevard is one of the cleanest in the state. Picture a 3.5-mile stretch of white beach with few tourists and no high-rises. It’s just you and the waves and the seabirds at Ocean Beach, on the westernmost border of San Francisco, adjacent to Golden Gate Park. Great for strolling and flying kites, but the water is frigid and the currents hazardous for all but the most experienced surfers. The sunniest months for a beach walk are September and October. The beach is almost always covered in fog throughout late spring and summer, with average temperatures in the 50s. This 1925 Spanish Revival-style building at the park’s western end, designed by renowned architect Willis Polk, originally housed a lounge and bathing facilities for Ocean Beach swimmers on the ground floor and a restaurant upstairs. The ground floor’s striking frescoes, mosaics, and wood carvings were added in 1936-37 in a project funded by the Works Progress Administration (WPA). Painted by French-born painter and clothing designer Lucien Labaudt, the frescoes depict life in San Francisco during the Depression, including images of residents at play in Golden Gate Park and Land’s End. Labaudt recruited friends and family as models, but several well-known figures are included, among them legendary Golden Gate Park Superintendent John McLaren. Labaudt also designed and directed the tile work, created by Primo Caredio, and magnolia-wood carvings done by sculptor Michael von Meyer, including the intricate balustrade along the stairs leading to the second floor, with octopus newel posts, mermaids, deep-sea divers, old ships, and a sea monster. During World War II the Chalet was commandeered by the U.S. Army and used as a barracks for coastal defense forces operating the nearby signal station. In 1947, the Veterans of Foreign Wars (VFW) leased the building as a social hall, with a bar and pool tables downstairs and meeting rooms upstairs. Over time, the building deteriorated and the bar acquired a bad reputation. The VFW moved out in 1979 and the building sat empty and fenced off from the public until 1981, when an extensive restoration of the structure and artwork began; the chalet was listed on the National Register of Historic Places the same year. It reopened in 1996, and today the ground floor houses the Golden Gate Park visitor center and the Park Chalet restaurant; upstairs is the Beach Chalet restaurant, with sweeping views of the Pacific. 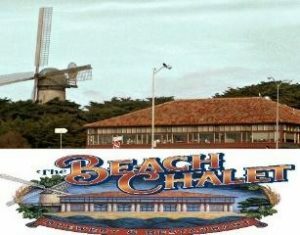 The Beach Chalet is at 1000 Great Highway, across from Ocean Beach, on the western edge of Golden Gate Park. Drive across the double-decker of Oakland Bay Bridge to Treasure Island and , where the 1937 World’s Fair was held, and which was the headquarters for the U.S. Navy. 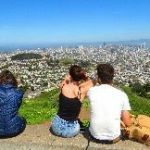 This is one of the most popular photo stops on our day and night tours, thanks to its spectacular and sweeping views of San Francisco’s downtown skyline. Treasure Island is an artificial island in San Francisco Bay and a neighborhood of the City of San Francisco. Built 1936–37 for the 1939 Golden Gate International Exposition, the island’s World’s Fair site is a California Historical Landmark. Buildings there have been listed on the National Register of Historic Places, and the historical Naval Station Treasure Island and auxiliary air facility (for airships, blimps, dirigibles, planes and seaplanes) are designated in the Geographic Names Information System. Yerba Buena Island sits in the San Francisco Bay between San Francisco and Oakland, California. The Yerba Buena Tunnel runs through its center and connects the western and eastern spans of the San Francisco–Oakland Bay Bridge. It has had several other names over the decades: Sea Bird Island, Wood Island, and Goat Island. The island is named after the town of Yerba Buena, which was named for the plant of the same name that was abundant in the area. The plant’s English and Spanish common name, Yerba Buena, is an alternate form of the Spanish hierba buena (literally meaning “good herb”), generally used to describe local species of the mint family. Today the military reservation southeast of the Yerba Buena Tunnel belongs to the United States Coast Guard (USCG) District Eleven. The US Coast Guard Sector San Francisco – Vessel Traffic Service (VTS) tower is located on Signal Road Bldg. 278 atop the peak of the island. The US Coast Guard Sector San Francisco Headquarters is co-located with US Coast Guard Station San Francisco on Healy Avenue @ Fresnel Way at water-level on the southeast coast of the island. The Coast Guard Aids to Navigation San Francisco has a navigational buoy repair facility on Fresnel Way. The USCG Senior Officers’ residences are in Quarters A, B, C, 8 and 9 off of Hillcrest Road on the hill atop the USCG base. During the summer of 2011, the Department of Homeland Security – United States Coast Guard opened the new SAFE Port Act (2006) Interagency Operations Center (IOC at Bldg. 100 site on Spindrift Circle) on the US Coast Guard Sector / Station San Francisco base. The IOC houses the VTS, WatchKeeper and the US Coast Guard Sector San Francisco Command Center together in one building. 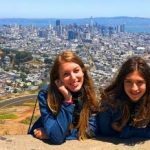 Fort Mason, once known as San Francisco Port of Embarkation, US Army, in San Francisco, California, is a former United States Army post located in the northern Marina District, alongside San Francisco Bay. Fort Mason served as an Army post for more than 100 years, initially as a coastal defense site and subsequently as a military port facility. During World War II, it was the principal port for the Pacific campaign. Today it is part of the Golden Gate National Recreation Area and the site of several cultural facilities. It is a National Historic Landmark District with over 49 buildings of historic significance, spread over 1,200 acres (490 ha). Fort Mason can be split into two distinct areas. The upper area, sometimes called Fort Mason, is situated on a headland and was the site of the original coastal fortifications. The lower area, Fort Mason Center, is situated close to water level to the west of Upper Fort Mason, and is the site of the former military port, with its piers and warehouses. The Marina Green lies to the west of Fort Mason, while Aquatic Park is to the east. 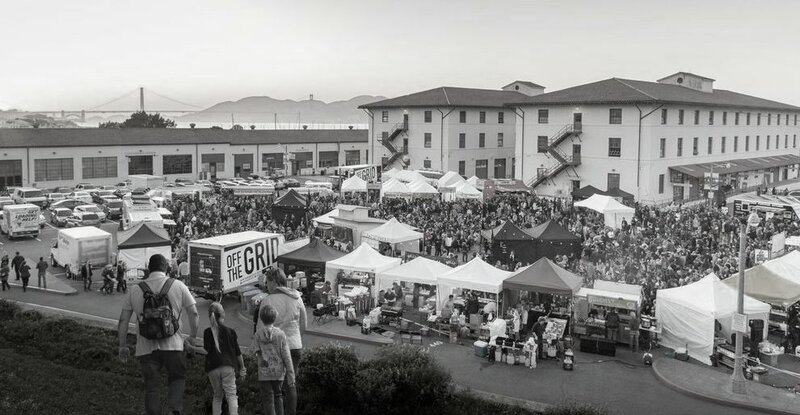 Off the Grid at Fort Mason features 32 food vendors every Friday from 5-10 p.m. In addition to local wines and Magnolia beers, there are DJs from 5-7:30 p.m. followed by live music from 8-10 p.m. Farmers Market: Held every Sunday from 9:30 a.m. to 1:30 p.m. 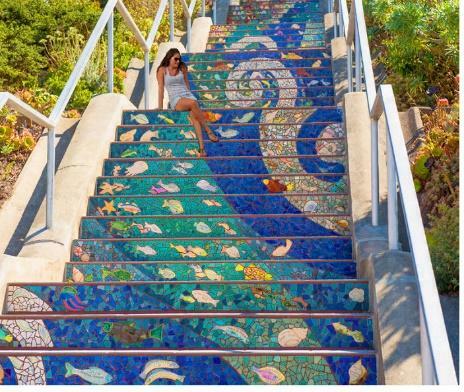 This beautiful mosaic-tiled called Moraga Stairs start at Moraga St & 16th Ave and climb up to 15th Ave. This is a creative, community-driven mosaic featuring a flowing sea to stars design up a 163-step stairway. It’s located at 16th Ave, in San Francisco, CA 9412, and open from 9AM–7PM. Mission Dolores Park is located two blocks south of Mission Dolores at the western edge of the Mission District. Dolores Park is bounded by 18th Street on the north, 20th Street on the south, Dolores Street on the east and Church Street on the west. The northern end of Dolores Park is located directly across the street from Mission High School. On its eastern, southern and western sides, the park is surrounded by residential buildings of two to four stories, in various architectural styles. South of the park is a hillside area known as “Dolores Heights,” while The Castro neighborhood is located a short distance to the west. The park’s topography is characterized by a strong slope from the southwest down to the northeast, offering an unobstructed northeast-looking view of downtown San Francisco, in particular from the southwest corner. The park lies east of Twin Peaks in the warm and sunny microclimate of the Mission neighborhood, which was named one of the coolest neighborhoods in the world in 2016. 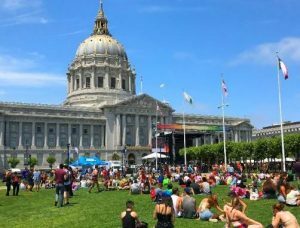 In recent years, the park’s popularity among San Franciscans looking for outdoor relaxation and recreation has increased, and as of 2016 it was attracting up to 7,000-10,000 people on a sunny weekend day. Read the last part of this blog here.